Whenever you come across some really nice juicy and sweet plums, buy them and make this salad!!! I love the sweet taste of fresh fruit combined with greens or vegetables in a salad. Whenever I come along a recipe that has apples, grapes, pomegranates etc. I must try it. This one here caught my eye, as the dressing consists of a combination of pureed plum and balsamic vinegar. The combination of flavors in this salad is absolutely amazing, the sweet plums go really well with the feta cheese and the nut give some crunch to the dish. A light salad perfect for hot summer days (yes, I know it's winter now in most parts of the world) or just as a light meal after some heavy or festive food days (that applies more to winter, though). For the dressing, combine all ingredients in a food processor and puree. For the salad, combine mixed greens and plum wedges in a serving bowl. 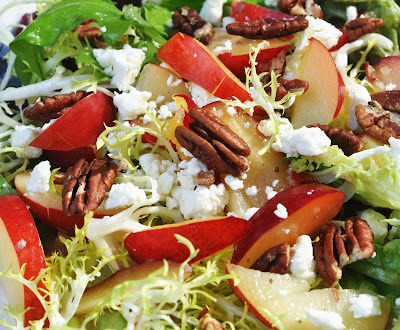 Sprinkle pecan halves, feta cheese and dressing over the salad. Serve immediately.